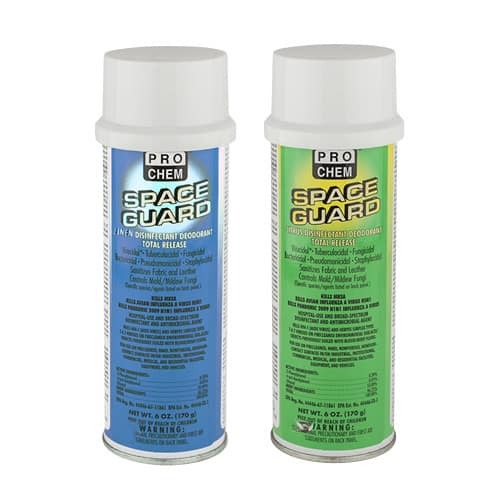 SPACE GUARD | Pro Chem, Inc.
SPACE GUARD is a highly versatile disinfectant, antimicrobial agent, sanitizer, deodorizer and mildewstat. Because it is safe to use on nonporous surfaces as well as fabric, overspray will not affect multi-material pieces such as chairs and sofas. Approved for hospital use, this product can be used to fog hospital rooms between patients or just to supplement disinfection and routine cleaning procedures and practices. The fogging delivery system enables this product to treat areas that cannot be reached by typical products. See product label for complete directions. Take precautions listed on product label to ensure no surfaces treated with this product will come into direct contact with mucous membranes, bloodstream or normally sterile areas of the body. Turn off ALL ignition sources. Cover exposed food, dishes, and food-handling equipment. GENERAL: Shake container well before each use and hold it upright while spraying. For use on precleaned, hard, nonporous surfaces; not for use on humans or animals. Not for use where food or related products are prepared, processed or stored. Remove food or related products from the area being treated. Avoid use where product would contact counters or tabletops where food may be stored, prepared or processed. Do not use on waxed/polished surfaces, water-based “latex” paint, shellac, cellulose (such as rayon) or other alcohol-sensitive materials. 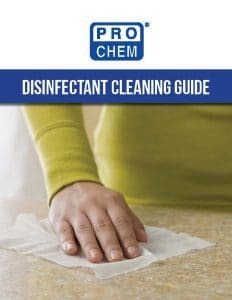 DISINFECT HARD, NON-POROUS SURFACES: Preclean surfaces. Hold container upright about 6-8” from surface. Spray to thoroughly wet hard, nonporous surfaces. Treated surfaces must remain wet for 10 minutes. Allow to air dry. Rinse all surfaces that come in contact with food such as counters, appliances, tables with potable water. Do not use on utensils, glassware and dishes. DISINFECT TOILETS & URINALS: Remove gross filth prior to disinfection. Empty toilet bowl or urinal. Hold container upright about 6-8” from surface. Spray to thoroughly wet hard, nonporous surfaces. Brush over ex­posed surfaces and under the rim. Allow to stand for 10 minutes, then flush. DISINFECT VETERINARY OFFICES & ANIMAL AREAS: Remove all animals and feed from premises, vehicles, cages, kennels, etc. Remove all litter, drop­pings, and manure from floors, walls and surfaces of facilities occupied or traversed by animals. Empty all feeding and water ap­pliances. Thoroughly clean all surfaces with soap or detergent and rinse with water. Hold container upright about 6-8” from surface. Spray to thoroughly wet hard, nonporous surfaces. Treated surfaces must remain wet for 10 minutes. Allow to air dry. Immerse all halters, collars, leashes and other types of equipment used in handling and restraining animals as well as forks, shovels and scrapers used for removing litter and manure. Ventilate buildings, vehicles and other closed spaces. Do not house animals or employ equipment until treatment has been absorbed, set or dried. Thoroughly scrub feeding and watering equipment with soap or detergent, and rinse with potable water before reuse. TO CLEAN/DEODORIZE: Hold container upright about 6-8” from surface. Spray surface and allow to air dry. TO CONTROL MOLD/MILDEW & SANITIZE POROUS SURFACES: Inhibits the growth of Aspergillus niger and Penicillium glaucum fungi and controls Staphylococcus aureus and Klebsiella pneumoniae on porous surfaces such as fabric and leather surfaces. Hold container upright about 6-8” from surface. Spray to thoroughly wet surfaces. Treated surfaces must remain wet for 5 minutes. Allow surfaces to air dry. For mold/mildew control, repeat application every 7 days or more frequently if new growth appears. TO KILL HIV-1 (Human Immunodeficiency Virus Type 1; AIDS Virus) ON PRECLEANED SURFACES/OBJECTS in health care or other settings with inanimate environmental surfaces/objects associated with the potential for transmission of HIV-1 and likely to be soiled with blood/body fluids, follow these additional SPECIAL INSTRUCTIONS FOR CLEANING AND DECONTAMINATING AGAINST HIV-1 ON SURFACES/OBJECTS SOILED WITH BLOOD/BODY FLUIDS: PERSONAL PROTECTION – Barrier protection items such as disposable latex gloves, gowns, masks and eye coverings must be worn when handling items soiled with blood/body fluids. CLEANING PROCEDURE – Blood/body fluids must be thoroughly cleaned from surfaces/objects before application of this product as a disinfectant. CONTACT TIME – 10 minutes. DISPOSAL OF INFECTIOUS MATERIALS – Blood/body fluids and other materials removed from or used to clean surfaces/objects must be autoclaved and disposed of according to federal, state and local regulations for infectious waste disposal.